HOUSTON (Reuters) - A glance at the attendee list at one of the world's largest energy industry events in Houston this week left little question about the growing influence of the United States over global oil politics. As the United States weans itself off foreign oil imports - thanks to booming domestic production - the complex web of politics and business interests that have shaped decades of Washington's energy diplomacy in the Middle East and beyond is changing. 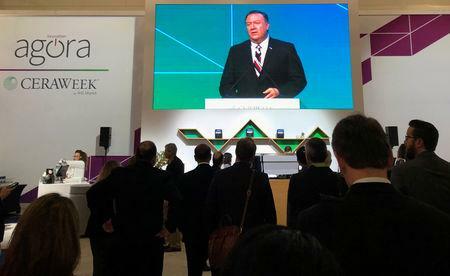 In his keynote address, Pompeo spoke of exploiting the power the United States is accruing through rising energy supply in "punishing bad actors"; he laid out a vision of working with energy firms to isolate Iran and Venezuela; and he emphasized the need to protect oil supplies by countering China's moves to control the South China Sea. Just two years ago, Saudi Oil Minister Khalid al-Falih delivered a combative keynote speech warning U.S. shale executives that OPEC would not carry "free riders" in its efforts to balance world oil supply and demand. 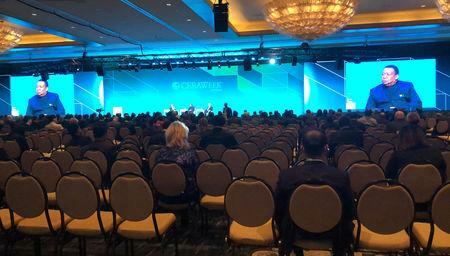 Beyond his keynote at the Houston conference - the first ever for a sitting Secretary of State at the gathering known as CERAWeek - Pompeo circulated among executives in closed-door meetings, even, according to a source, hosting a group informally at Pappasito's Cantina, a Mexican restaurant in the Hilton Americas Hotel where the conference took place. "I'm not used to it, but I think it's great," said Vicki Hollub, chief executive of Occidental Petroleum, saying she was impressed by Pompeo and his team's outreach. Occidental has been one of the biggest winners from the surge of U.S. shale exports. At that meeting, first reported by Reuters, Pompeo talked about how the government and the world's top energy companies could work together to encourage U.S. allies to buy more of its oil, according to two sources familiar with the discussion. He also asked for their cooperation on Iran. Coming into office, President Donald Trump promised to deregulate the energy industry and assert U.S. oil independence - a sharp turn from an Obama administration that, while placing sanctions on Iran's oil exports, largely built its energy policy around renewables and reducing emissions. "Under the Trump administration the U.S. feels far more emboldened by our oil-and-gas production and the support and alliance they feel with Saudi Arabia," said Sarah Ladislaw, who leads energy policy analysis at the Center for Strategic and International Studies. Washington's growing influence, she added, has already started to shift oil politics among allies and adversaries across the world. Germany in February said it would consider building two LNG terminals to import from the United States, bowing to U.S. pressure to diversify supply after Trump termed Nord Stream 2 a "horrific" project that would make Berlin more reliant on Russia. "We don’t want our European allies hooked on Russian gas through the Nord Stream II project, any more than we ourselves want to be dependent on Venezuelan oil supplies," Pompeo told the conference. "OPEC is a less important player because the United States is the number-one producer of oil, natural gas and refined products," said Mike Sommers, president of U.S. industry group the American Petroleum Agency, at the conference. "The most relevant aspect of OPEC now is where it has reached beyond its organization, which is Russia, and whether that can be sustained or formalized," said Suzanne Maloney, deputy director of the Foreign Policy program at the Brookings Institution. There have been mixed signals on that front. Russia's Igor Sechin, head of oil giant Rosneft, has expressed support for ending production cuts, believing OPEC's deal plays into shale's hands because it underpins prices. "They (OPEC) know they cannot do it alone. To swing the pendulum from left to right in terms of production to make sure you get the price that you want, you still need other producers," said Saidu Muhammad, chief gas and power operating officer at Nigerian National Petroleum Corp.